If you hopped into a time machine and went back to before the London Knights and the Guelph Storm started their OHL Western Conference semi-final series, you would hear all kinds of descriptions regarding what it was expected to be like. “Easy” would not be one of them. 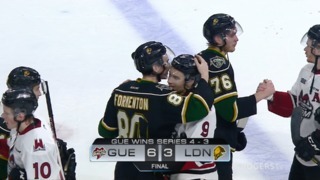 The Guelph Storm held on to win a game they had to win, 4-3 at the Sleeman Centre in Guelph on Wednesday night to prevent the London Knights from taking the series in four straight. Hunter pointed to a couple of things defensively that he felt the Storm were able to take advantage of offensively. “We’ll look back at what led to their goals, which was not getting the puck out and not getting the puck deep,” admitted Hunter. With Guelph ahead 3-1 heading into the third period, Liam Foudy and Billy Moskal combined on a goal to make it 3-2 just 12 seconds after the opening faceoff. London continued to push and outshot the Storm 18-4 in the final 20 minutes. Liam Hawel extended the Storm lead to two goals with just over five minutes remaining and Alec Regula cut it to one again on a Knights power play just 44 seconds after that, but London could not find the equalizer before the final horn. 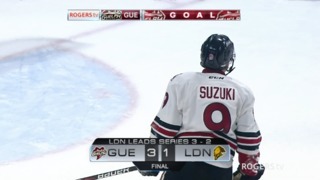 Londoner Nick Suzuki had a goal and two assists for Guelph and Storm forward Nate Scharr scored his first two goals of the series. Guelph goalie Anthony Popovich had allowed seven goals on 22 shots in Game 3. He made 39 saves in the Storm net on Wednesday. Jordan Kooy stopped 27 shots for London, but saw a personal seven-game winning streak end. The Knights were 2-for-5 on the power play. Guelph was 1-for 4. 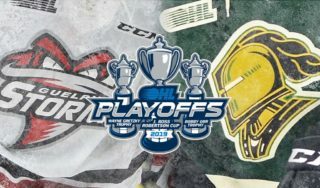 Game 5 is Friday night at 7:30pm at Budweiser Gardens in London. Guelph came into Game 4 looking for their first lead in any game so far and got it on a power play in the first period. Nate Schnarr poked home a puck in the London crease for his third goal of the playoffs at 4:24. The Knights tied the game at 17:32 of the opening period on a power play of their own. Alec Regula flipped a puck in front to Adam Boqvist and he scored his ninth goal of the post-season. That ties him with Owen Tippett of the Saginaw Spirit for the playoff lead. Schnarr deflected a Dmitri Samorukov shot past Jordan Kooy less than five minutes into the second period to make it 2-1 Storm. Then, 47 seconds after that, a Nick Suzuki shot hit something in front and wound up in the Knights net for a two-goal Storm lead. Off the faceoff to begin the third period, Liam Foudy of the Knights split the defence, went in and then dished a backhand pass to Billy Moskal and he scored to cut the lead to 4-3. Liam Hawel and Alec Regula exchanged goals after that to close out the scoring.